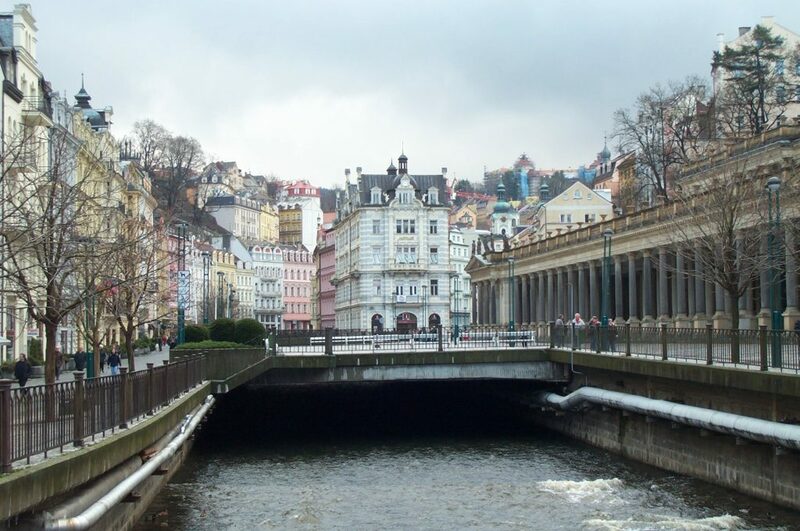 Karlovy Vary had to be one of the prettiest cities I had ever seen — for three reasons. The first was the almost complete makeover the city has been given since 1989. The paint almost smelled as fresh as the colors were bright on nearly every building downtown. The second was the virtual three-dimensional layout of the city, that followed the deeply-cut Tepla River valley almost exactly. 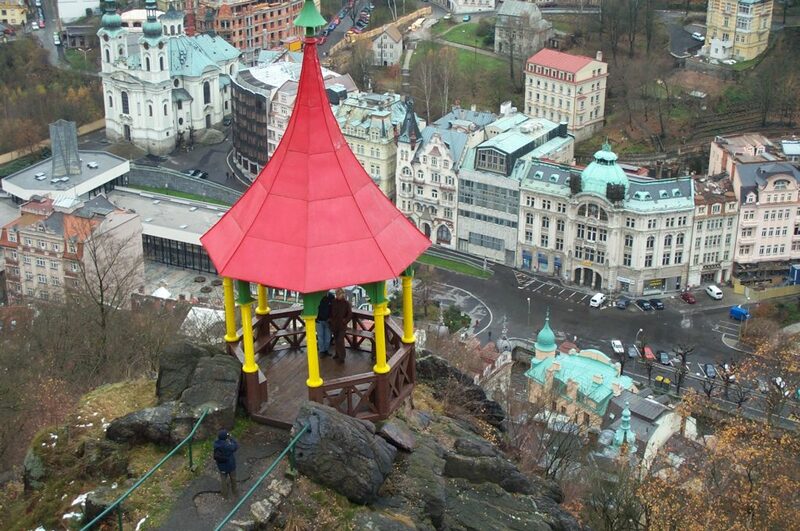 And the third was the wonderful network of mountain trails surrounding Karlovy Vary that allows one about a dozen different high vantage points over the city. Karlovy Vary was an old city. It’s original Germanic name, Carlsbad (“Charles’ Baths”), reflected the time when King Charles IV established the modern city. The reference to “baths” was quite accurate, as the city’s thermal springs made it into a very popular spa town that was being rediscovered by westerners since the end of the Cold War. 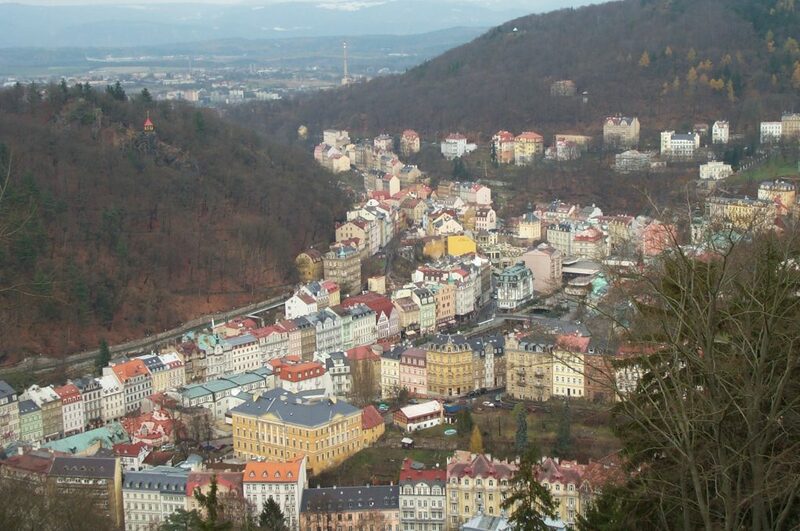 As Czech had moved closer and closer to full integration with the West, Karlovy Vary (just a stone’s throw across the German border) became one of the Republic’s darlings. 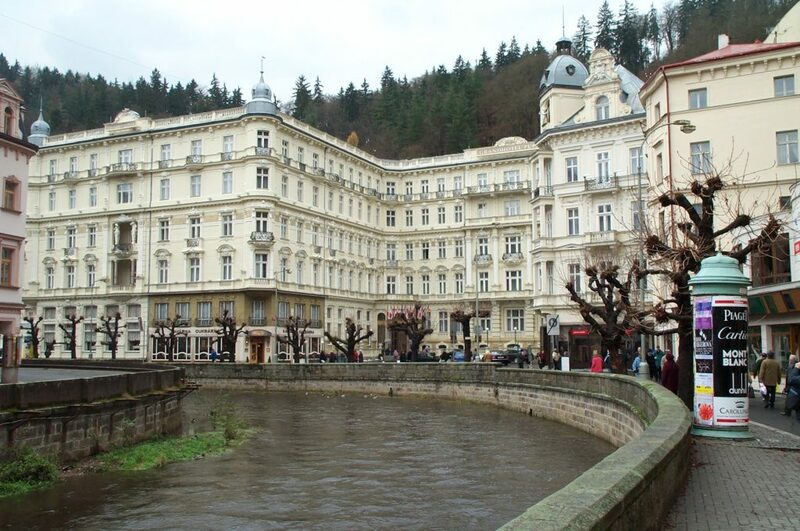 Karlovy Vary began at the junction where the Tepla River spills into the Ohri and followed the Tepla into the hills. The valley was narrow and winding, and therefore the city followed suit. The first photograph showed one part of the town and demonstrated ohw the river and city clustered together along the tight valley. The train station was constructed directly above the junction of the two rivers, so navigating the city was very easy. I simply followed the Tepla. What I found was simply amazing. Indicative of the old Austro-Hungarian imperial towns, the sides of the River were bounded with a kaleidoscope of tightly packed and extraordinarily decorated buildings, many roughly the same height and sporting pastel colors. One example was the Hotel Pushkin, shown in the second photograph, with a brilliant gold facade. I also noted the intricate details among the surrounding buildings. The bathhouses came in two flavors — classic and modern. Two of the “classic” bathhouses (láznĕ in Czech) were positioned at the opposite ends of the town. The Láznĕ V (also known as the Elizabeth Bath House) was the first major structure I encountered at the north end. This was a white ‘colonial manor’- style structure that had a park in front decorated with cabbage flowers. To the far south was Láznĕ I (the Emporer’s Bath House), a gold and beige building that appeared more royal. In the middle of the city sat the modern Thermal (yes, that’s what it was called), a glass-and-steel skyscraper. The ground floor of the Thermal was a brilliant modern art gallery. Walking through the center of downtown was a real pleasure. Both sides of the river were loaded with great shopping and eating, even on a Sunday (which was the day I went). Souvenir and crystal shops were the most common, and much of the merchandise was Czech-made. However, a number of western European brand names and chain department stores were also available, albeit in smaller numbers compared with Prague. It seemed like every corner had its landmark. 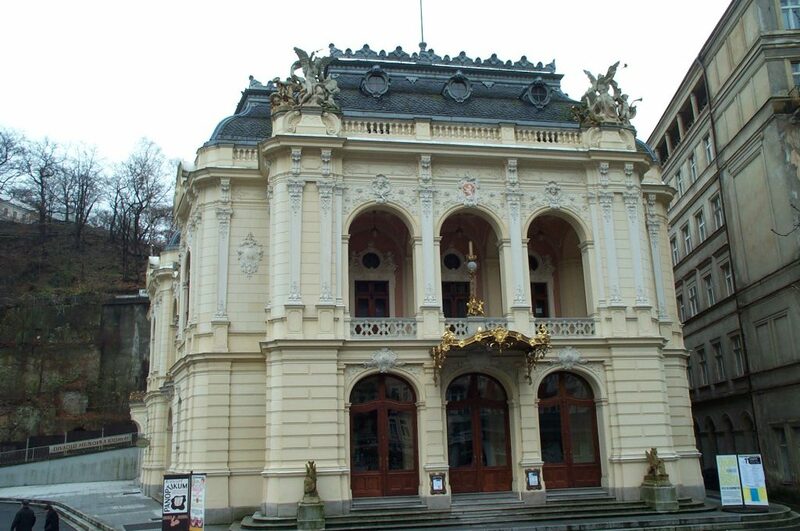 The third photograph shows a side view of the magnificent Divadlo, or City theater. It was difficult to capture all the detail in a reduced photo, but you can see how bright and lavish the white trim was. Another fantastic landmark was the Mlýnská Kolonáda, or Mill Colonnade, shown in the fourth photograph. This colonnade seemed purely decorative. I could find no other purpose for structure as it didn’t house any storefronts or museums underneath. In front of it, behind the park benches in the center of the photo, was a large square that divided into two streets, one at each side of the off-white building in the center of the photo. That structure, by the way, contained the Tourist Information Bureau. Toward the south end, the Tepla turned a sharp corner, and it was there that the most magnificent of Karlovy Vary’s hotels was found, the Grand Hotel Pupp, shown in the fifth photograph. It was so large, I could only fit half the building in the photo. The rest was off to the left. As I wandered through the downtown, having to occasionally pick my jaw up off the ground, I kept looking up towards the ridgelines above and occasionally found gazeboes and other structures that were clearly placed as vantage points, and I readily saw some of the zig-zagging mountain paths leading up. So, I decided to devote some time exploring those paths. Climbing up the Zámecký vrch (one of the high streets in the west side), I came across a map and discovered that there were dozens of marked woodland trails in a fifteen kilometer radius around the city — connecting together all the neighboring villages and the various hilltops, with their respective vantage points. Navigating them was simple, but not easy. Doing this took some serious climbing, but it was worth it. There were three primary vantage points over the town I reached. The sixth photograph showed the view from the Jelení Skok, the “Stag’s Leap” which was marked by an obelisk with a mountain goat on top. There were three levels — the obelisk at the bottom, the red and yellow gazebo shown in the middle, and a cross and monument on top (the gazebo photo was taken from that cross, shooting downward). A red sandstone castle-tower-shaped structure called the Vyhílda Karla IV (monument to King Charles IV, whose name claims about a dozen structures in town) was where I took the first photograph in this travelogue. In between them was the highest structure, the Diana Tower (Rozhledna Diana), that offered an OK view of the city but great views of the beautiful forests surrounding Karlovy Vary. Those who might not have been up to the climb I took and the subsequent three-kilometer walk had funicular trains running directly up to the Diana, and the paths were downhill to the other points. But those were just three of the many vantage points I hit — I also climbed the east side and found several parks with great views. Also, the Hotel Imperial is at the highest point and is Karlovy Vary’s most imposing structure (but alas it was under total renovation when I visited). 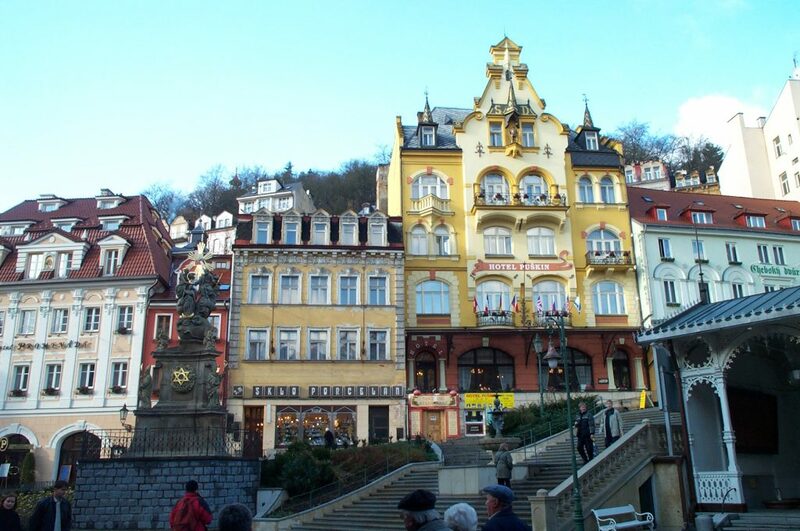 Karlovy Vary was a feast for the eyes. I was greatly impressed with its beauty, the way it cohabitated with its wonderful natural surroundings, and the way it embraced the Tepla River. I highly recommend it as a destination if you are going to the Czech Republic.